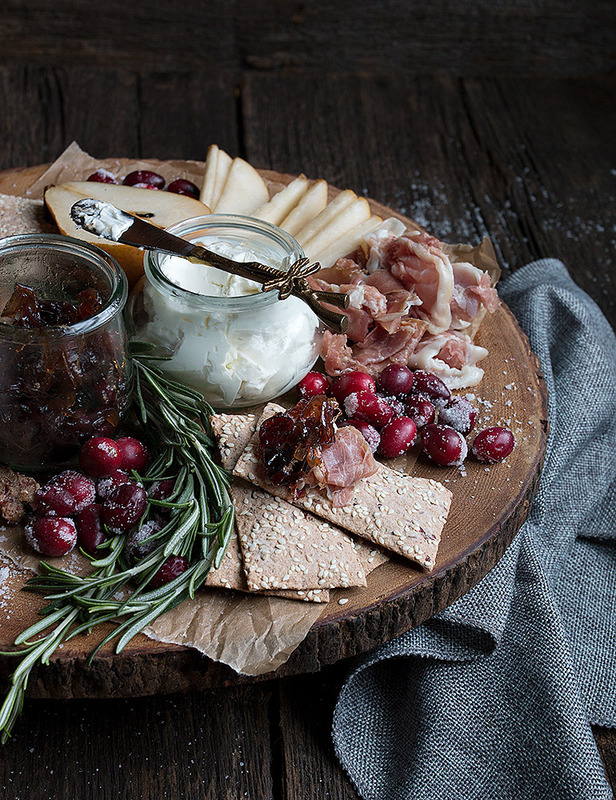 Easy and delicious, this Cranberry-Themed Holiday Platter features prosciutto, bosc pear, sugared cranberries, fresh rosemary, lovely Ozery lavash crackers, cinnamon candied pecans, spreadable goat cheese and a homemade cranberry-onion marmalade. Disclosure: This post is sponsored by Ozery Bakery. As always, all opinions are my own. Thanks for supporting brands that support Seasons and Suppers. When it comes to holiday entertaining, I like to keep it casual, simple and of course, delicious. 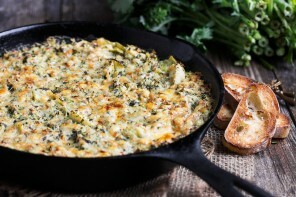 This time of year, I’m a fan of concentrating on just a few complementary flavours and textures together, rather than trying to “do it all” :) I make up the components ahead and keep my fridge stocked with the meat and cheese and I’m always ready when a holiday moment demands a platter of nice food! This Cranberry-Themed Holiday Platter is a great example of that idea. 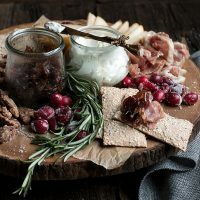 All of the flavours go so beautifully together, from the lovely parma prosciutto, to the tangy, spreadable goat cheese, the delicious cranberry-onion marmalade, the bosc pear slices and the cinnamon candied pecans. 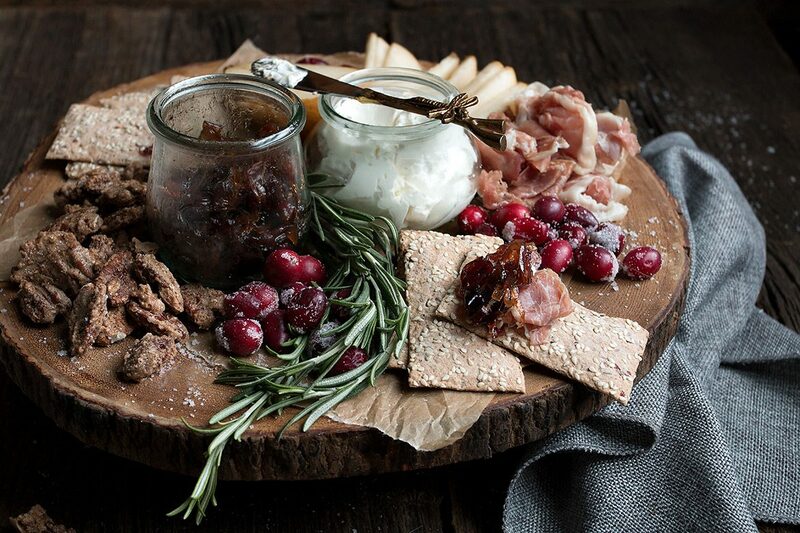 Quick-sugared cranberries and rosemary provide a festive touch to the platter. And of course, no great holiday platter is complete without a great cracker, and Ozery Bakery Organic Cranberry and Grains Lavash fit that bill perfectly. 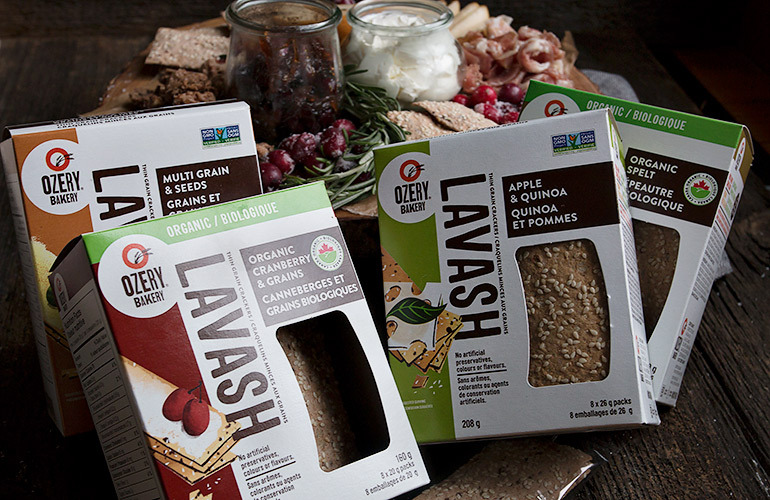 You’ll love the Ozery Bakery Lavash for your holiday entertaining. Available in 4 varieties, they are all delicious, made from great ingredients, sturdy enough for you to load up with toppings and boxed in individually wrapped packages, so you only need to unwrap what you need, keeping the rest of the box fresh for next time. And of course, Ozery Bakery is all about “Keeping it Real”, so these Lavash are made with no artificial preservatives and are non-GMO. Ozery Bakery started with two brothers, one big idea. Since 1996, the Ozery family has been inventing alternatives to traditional bread products that are made from hearty whole grains, fruits, and seeds. Everything they make is intended to help you eat well and feel good. You can learn more about this product and all the Ozery Bakery products, along with more recipe ideas at the Ozery Bakery Website! Find a store that carries Ozery Bakery products in your area on their store locator page, as well! You can make the candied pecans, cranberry-onion marmalade and the sugared cranberries ahead and then you will always prepared to make a quick platter when you need to! Speaking of cranberries, I’m calling the “quick” because I only let them stand in the sugar syrup for a couple of hours. As such, they are probably more decoration than an edible treat. If you want to be less quick and enjoy eating them, let the cranberries soak in the syrup in the fridge for 24 hours before sugaring. I’ve used spreadable goat cheese here, but you could easily substitute any nice spreadable cheese you like. 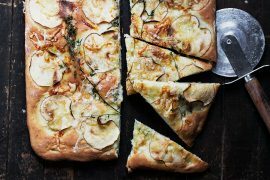 If you don’t have pears on hand, apples work nicely with these flavours, as well. 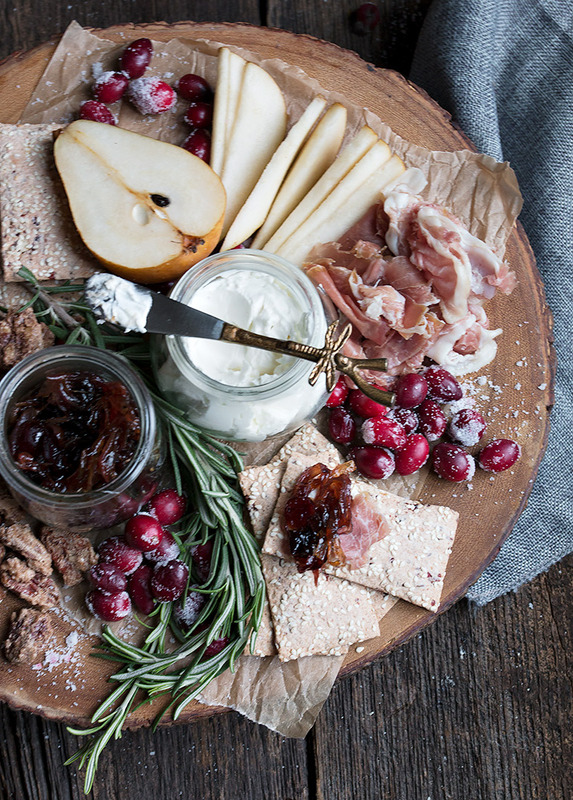 A delicious platter for holiday entertaining, with prosciutto, sugared cranberries, cinnamon candied pecans, spreadable goat cheese, bosc pear slices, homemade cranberry onion marmalade and cranberry whole grain lavash. For the Quick Sugared Cranberries: Bring the water and sugar to a boil in a medium saucepan. Remove from heat. Add cranberries. Let stand in pot at room temperature for an hour or two. *The cranberries want to float, so if you have a small plate or something you can place on top to push them down into the sugar water, even better. When cranberries have sat and are fully cool, pour through a strainer to drain the liquid and discard, reserving the cranberries. Scatter a 1/4 cup or so of white sugar on a plate. Add about 6 cranberries at a time to the plate and use a fork to push them around in the sugar, until coated. Carefully remove to a cooling rack. Repeat with all the cranberries, adding more fresh sugar to the plate as needed. Allow to stand at room temperature several hours, until dried. Once dried, you can store in an airtight container and use as needed. For the Cinnamon Candied Pecans: Preheat the oven to 250F and line a baking sheet with parchment paper. In a medium bowl, whisk the egg white until frothy. Add the water, vanilla, white sugar, cinnamon and salt and whisk to combine well. Place the pecans in another medium bowl. Add about half of the egg white mixture to the pecans and stir to coat. Add more egg white mixture as needed to just thoroughly coat the pecans. You may not need it all. Scatter coated pecans on to the prepared baking sheet in an even layer, with as much space in between as you can. Place in preheated oven and bake for 45-60 minutes, stirring every 15 minutes, or until the coating is dried and "candied". Allow to cool completely on the baking sheet, then remove to an airtight container to store, breaking them apart in to individual pecans, as needed. For the Cranberry Onion Marmalade: In a large skillet, heat the olive oil over medium heat. Add the sliced onion and cook stirring, until onion begins to soften. Add 1/4 cup water and stir to combine. Allow to cook until the water disappears. Add another 1/4 cup water and stir to combine. Allow to cook again until the water disappears. Continue this process, adding 1/4 cup water twice more, until the onions are very soft . Meanwhile, combine the dried cranberries, brown sugar and balsamic vinegar in a small bowl. Set aside. When you have added all the water. Add the cranberry/sugar/balsamic vinegar mixture to the skillet. Reduce heat to medium low. Cook, stirring occasionally, until onions are very soft and the liquid has become syrupy, about 10-15 minutes. Season with a pinch of salt and some freshly ground pepper. Remove to a small bowl or jar. Allow to cool slightly, then cover and refrigerate to use as needed. For the Platter: Transfer some onion marmalade to a small bowl or jar. Add some spreadable goat cheese to another small bowl or jar. Place in the middle of the platter. Add a sprig of fresh rosemary between the two jars. Add a section of prosciutto and/or porchetta, a section of sliced pears, a section of candied pecans and a couple of sections of lavash crackers. Scatter some sugared cranberries here and there to fill in. Enjoy! So beautiful, I love this holiday platter! Now that’s a holiday platter! I’m excited for holiday gatherings just looking at it! And that marmalade sounds amazing! 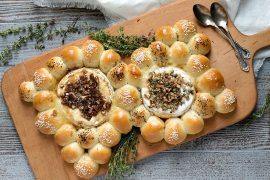 This is a beautiful appetizer platter Jennifer, so festive perfect for the holiday season. Those crackers sound wonderful and I will keep my eye open for the porchetta! Thanks Chris and yes, that porchetta was so nice! oh goodness, i wish i had that whole platter for breakfast right now! On Thanksgiving, I was the only one who indulged in cranberry sauce and cranberry chutney. I have an odd family. Your sugared cranberries are so pretty! I love all the components on this platter Jennifer! Especially that cranberry onion marmalade! Thanks Mary Ann and yes, I love the flavours in this marmalade. Go so perfectly with so many things! This is lovely Jennifer, I can just imagine the fabulous combination of the tangy cranberries with the rich Italian meats, my mouth is watering! Thanks so much, Sue :) It was a wonderful treat, for sure. Lots of flavour! I can make a meal out of a beautiful platter like this! Love everything about this display. Looks like a party to me! Thanks Tricia :) And yes, meat, cheese, fruit and nuts all together sounds like a meal to me!